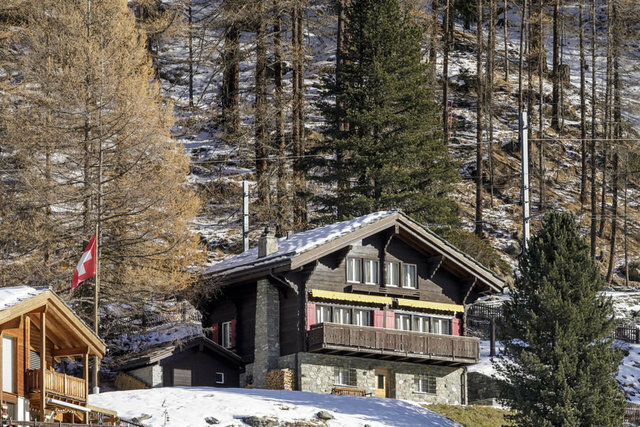 Unique property with substantial surrounding ground on the outskirts of Zermatt. The easiest way to the chalet goes along the AHV Weg starting in Winkelmatten. When you have a lot of things to carry you can even take the Gornergrat train that upon request stops right behind the house. The main access to the building is from the front which opens to an entrance area with two ensuite bedrooms, one on each side. At the end of the corridor you have stairs going either up or down to the basement floor which can be reached through a separate entrance from the side as well. It leads to a hall with an open ski storage and a laundry room, a staff studio with an ensuite shower room and a wine cellar. Before walking into the living and dining area spread over the whole width of the first floor you will find a guest toilet on one side and a separate kitchen on the other that can be partially opened during meals. Well hidden behind the wall of the couch corner next to the fireplace is a small office space. The top floor which was once divided in two separate bedrooms has become one big master bedroom with two bathrooms. The chalet offers unobstructed views from every single floor and has a gardening house attached with a nice little terrace in front of it. It was built with quality and attention to detail and most of the furniture throughout the house has been made to measure.